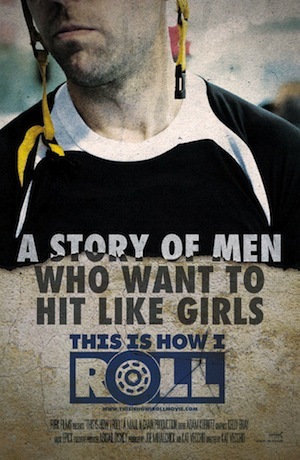 Last weekend, I was lucky enough to attend a screening of This Is How I Roll, a documentary about the growing presence of men's roller derby teams. Not satisfied with acting as coaches and referees -- or standing on the sidelines rooting for their derby girlfriends -- a small group of guys started talking about forming their own team and, eventually, their own roller derby league. It sounds like it should have been no big deal. After all, roller derby is a sport, and why should guys have a problem getting into sports? As it turns out, men trying to break into a sport dominated -- and revived -- by women was not as easy as it sounds. After the jump, hear from the filmmakers of This Is How I Roll, producer and director Kat Vecchio and Joe Mihalchick, producer and men's derby skater Maulin' Brando with the New York Shock Exchange. Jamie Frevele: Was the sexism against men's roller derby immediate, or was it gradual? Kat Vecchio: Some of the very first men’s bouts involved pickup teams, and were treated as kind of one-off events. The first public game the Pioneer Valley men played was against a group of referees. So as Joe mentioned at the Q&A [at the screening in Huntington, New York on August 26] there was this initial reaction that can kind of be summed up as “Oh, isn’t that cute. Good for you guys!” When it became clear that there was a real drive among these skaters to start forming real teams, then you started to get a sense that not everyone would be welcoming. Jamie: When did men first start forming their own teams? Kat: Pioneer Valley Roller Derby in Massachusetts was founded in 2005, and they were unusual in that they decided from the get-go to have a women’s and a men’s team. It would be 2006 before the men would get to play in their first public game, an exhibition scrimmage against The Charm City Roller Girls co-ed referee staff. By 2007, the Harm City Homicide, out of Baltimore, and the New York Shock Exchange had formed. These three teams, all based on the east coast, were the first men’s teams of modern flat track roller derby. Jamie: Were teams generally only comprised of refs and coaches for women's derby teams? Kat: I think some of the early men’s teams had a high number of refs, managers and boyfriends associated with the women’s teams on their rosters because they were the easiest to recruit. They already knew about the sport, had an understanding of the rules, and in the case of the referees, they already knew how to skate! As the teams started to play public bouts and hold events they were able to cast a wider net for recruitment. Jamie: Describe the backgrounds (age, day jobs, etc.) of some of the men's derby players. Are there any notable differences between the men and the women? Kat: While it varies from city to city, and now country to country, roller derby has always attracted a pretty diverse group of people. I think the median age for the teams (both men and women) that I am familiar with tends to be late 20s to early 30s. However there are many skaters who are younger or older, one of the skaters featured in This Is How I Roll was in his 50s and became a grandfather during the time we were filming. The professions for both the men and women run the gamut as well. While we don’t get into skaters personal lives in the film, the skaters featured have pretty diverse careers. There was a science teacher, a photographer, a beer vendor at a famous baseball stadium, an actor, a computer programmer, a mixed media sculptor, a call center operator, and a wine cellar manager. Jamie: When we spoke before the screening, we discussed how some didn't want to call this "sexism." What did they call it if it wasn't sexism? Kat: Some people felt the very idea of men experiencing sexism was impossible. The argument was that men have so much power in our society, that it was not possible for them to be disenfranchised based on their gender. Then there were those people who argued that placing any limitations based on gender was inherently sexism, that it didn’t matter which group has more power in our society. We chose not to assert an argument one way or the other in the film, but to instead try to allow the story to unfold in a way that would get viewers asking questions, and hopefully challenge people to think about these things through a new and different lens. Jamie: How much has the men's derby league grown since the end of the film's production? Joe Mihalchick: The growth of men's derby has been exponential. When we finished production in mid-2011, the Men's Roller Derby Association contained 11 leagues from across the United States, a huge leap from the previous fall with only four teams, when it was called the Men's Derby Coalition. As of August 2012, the MRDA contains 25 leagues. There are close to 50 men's derby teams in the U.S. alone now, with numerous in Canada, England, France, South America, and Australia. June 2012 saw the first Men's European Roller Derby Championships. I would guess that very soon MRDA will become an international organization. Jamie: Was there ever any discussion about including transgender skaters? Kat: During filming, we were certainly aware that the inclusion of transgender skaters in roller derby was becoming a national conversation for the roller derby community, but we felt that we needed to keep the film focused on following this particular story. It can be tempting to try to make a documentary cover too much ground, and at the end of the day, you only have so much time. We were fitting three years into 72 minutes. I think it would have been a disservice to transgender skaters to not make their story front and center, and I really hope someone makes that film soon. Jamie: You mentioned that there were lots of issues, concerns, and considerations when it came to filming male skaters versus female skaters. Can you go into that in more detail? Kat: Once you focus a lens on something, you have put a frame around it and present it to a viewer. By doing that you have the power to change how people view that image. Whether we realize it or not, we have all been taught how we are supposed to read images, especially when it comes to images of women. What I found was that if was very easy to film the male skaters in a way that made them look powerful. Shooting at low angles made them look large, more substantial, and tough. However, we are conditioned to digest images of women a little differently, and shooting them from the same low angle sometimes felt almost voyeuristic. To really convey how tough they were you needed to shoot more straight on, really capture the action in the blocking and intensity in their faces. Jamie: Obviously there was a lot of opposition to men's derby. How easy (or difficult) was it to get those opinions on camera? Have any of them changed their minds since the end of production? Kat: Yes, as one woman says in the film (the head referee for the Men’s Roller Derby Association), once people really saw the men’s teams pay their dues, saw that they were serious and willing to contribute to the sport as a whole, then there started to be a lot more acceptance. Many people have changed their minds as they have seen how it developed. I think a lot of the initial dislike for men’s derby came from people who were really uneasy about what it could mean for the sport. This modern revival of roller derby is very new, and a lot of people had worked very hard to build it into a national, and now international sport for women. They were understandably cautious about what it would mean to add male teams to the mix. Female athletes have not had an easy road, and I think a level of protectiveness around a sport that was actually female-centered, is understandable. There were a lot of people, both male and female, who would speak in private about their dislike of the men skating, but would not do so on camera. I have a great deal of respect for the people who agreed to appear in the film. It is not an easy thing to go on public record with your opinions. Jamie: How do you hope to appeal to an audience who might not be familiar with men's derby, let alone women's derby? Kat: Some of the most enthusiastic reactions we have received have come from people who have never seen roller derby. I think audiences turn to documentaries like this to get a glimpse into a world they are not familiar with. The film is funny, and the characters are engaging, and you get a great behind-the-scenes look at what it takes to play roller derby. Jamie: Do you think that the lessons of gender equality in roller derby are relevant to pretty much anything that might be seen as divided between the sexes? Kat: I think that the issues in the film are certainly relevant outside the context of just roller derby. Should gender really be a factor in who gets to be an athlete, who gets to play a sport? Is a sport more or less legitimate because women or men play it? If female athletes traditionally have fewer opportunities in sports, is it fair to exclude men from a female-dominated sport? Jamie: There's a very hopeful moment at the end of the movie with Bloody Mary throwing her hat into the ring for the men's league, after a lot of "soul-searching," it seems. Do you think men will ever catch up to women in roller derby and there might be real equality one day? Kat: I’m not sure. The men’s teams are certainly continuing to grow and the sport as a whole is thriving, and I think both of those things are really exciting. Some people speculate that there are already so many opportunities for an audience to watch men slam into each other, that men’s roller derby will never have the same popularity as the women’s game. But, there were also people who thought that men’s derby would never have any audience, and that has certainly proven to be incorrect. Ultimately the men’s teams have been around for less time than many of the established women’s teams so it is difficult to compare them side-by-side. I think what is really important is that the sport as a whole is continuing to grow and develop. Joe: To me, this is a great way to examine our preconceived notions of what it means to be an athlete, to examine our expectations of who owns a sport while working within a very specific cross section. The best documentaries are the ones that work within a world that you might not be familiar with, but allows you to see universal ideas within a very specific group. I hope we can do this with This Is How I Roll. Victoria Jamieson’s 2015 graphic novel Roller Girl won the prestigious Newberry Honor Award and it’s easy to see why: Jamieson’s story of a young teen’s interest in roller derby is the perfect vehicle to explore the difficult and even traumatic way that girls’ friendships change as they become teenagers, while never losing sight of the core story, about personal excellence, teamwork, and hard-hitting, girl-positive roller derby.